Today only, while supplies last, get this Insignia™ - 75" Tripod Projector Screen for ONLY $49.99 (Retail $119.99)! 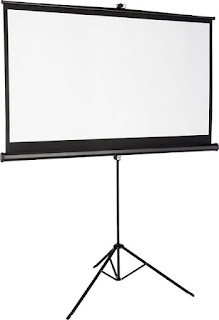 Watch movies and give presentations with this Insignia™ NS-SCR115 projector screen, which features a 36.8"H x 65.4"W viewing area to ensure a clear view from multiple spots in the room. A tripod stand promotes stable placement.